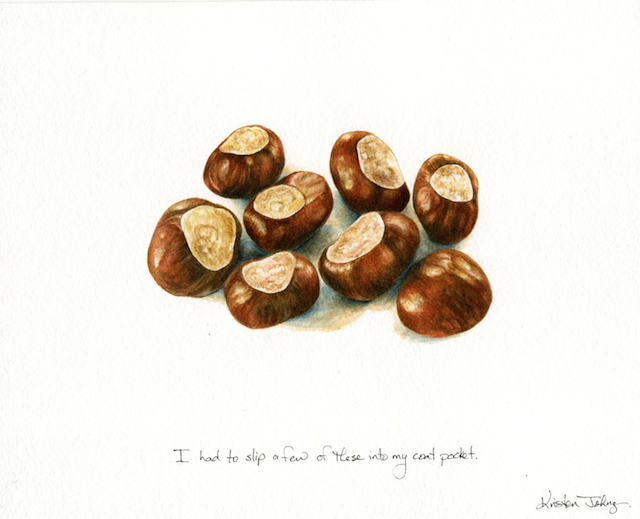 Every year the chestnuts fall from the big tree in our front yard and my favourite part of this event is watching all the neighbourhood kids stop, bend down, and pick up a few. They have such a look of wonder on their faces. Some kids like them for the smooth, glossy coating. Others like them still inside the spiky outer shells so they can stomp on them and bust them apart. I had to join in too, and so I call this painting: "I had to slip a few of these into my coat pocket". This original painting is available in my shop. This reminds me of Christmas, for some reason! One of your best paintings -- very lively!